For other uses, see Modelo (disambiguation). On June 12, 2008, The Wall Street Journal stated that Anheuser-Busch InBev, which owned a non-controlling 50% stake in the company, might attempt to acquire the remaining 50%. On June 29, 2012, it was announced that Anheuser-Busch InBev would acquire the remaining 50% stake for an all-cash price of $20.1 billion. On January 31, 2013, the US Department of Justice filed an anti-trust suit in an attempt to prevent the buyout. The matter was settled and the two companies merged in June 2013, with the transfer of all United States rights to Constellation Brands. As a result, all of the company's brands are made (in Mexico) by an unrelated company. In the United States, Grupo Modelo is distributed by Constellation Brands. In 2013, Constellation acquired Grupo Modelo's U.S. beer business from Anheuser-Busch InBev. María Asunción Aramburuzabala, known as Mariasun, is Mexico's second wealthiest woman and inherited her stake in Grupo Modelo. Grupo Modelo, founded in 1925, is the leader in Mexico in beer production, distribution and marketing, with 63.0% of the total (domestic and export) market share, as of December 31, 2008. It has seven brewing plants in Mexico, with a total annual installed capacity of 60 million hectoliters. It is the importer of Anheuser-Busch InBev's products in Mexico, including Budweiser, Bud Light and O'Doul's. It also imports the Chinese Tsingtao Brewery brand and the Danish beer Carlsberg. Through a partnership with Nestlé Waters, it produces and distributes in Mexico the bottled water brands Sta. María and Nestlé Pureza Vital, among others. The main Corona brand is Corona Extra, a 4.5% alcohol by volume pale lager. It is the top selling beer from Mexico and is one of the top five selling beers worldwide. Available in over 150 countries, it is also Mexico's leading export brand. It was first brewed in 1925 by Cervecería Modelo on the tenth anniversary of the brewery. In 1926 the brewery decided to package the beer in clear glass quarter bottles. In 1997, Corona Extra became the top-selling imported beer in the United States, surpassing Heineken. Corona Extra is available in a variety of bottled presentations, ranging from the 250 ml (8.5 U.S. fl oz; 8.8 imp fl oz) ampolleta (labeled Coronita and just referred as the cuartito) up to the 940 ml (31.8 U.S. fl oz; 33.1 imp fl oz) Corona Familiar (known as the Familiar or Litro). Corona Mega is now available in a 1.2 liter bottle. A draught version also exists, as does canned Corona in some markets. Unlike many beers, Corona is bottled in a clear bottle, increasing the opportunity for spoilage. Exposure to sunlight or light from fluorescent bulbs such as those used in refrigerated display cases significantly damages the taste of beer, yielding a taste that is often described as "skunky". This is the result of the essential hop oils spoiling due to UV exposure. The second Corona brand is Corona Light, the first light beer produced by this brewer. Corona Light has 3.4% alcohol by volume, 99 calories (0.41 kJ), per 355 ml (12.0 U.S. fl oz; 12.5 imp fl oz) bottle. Victoria is a 4% abv Vienna lager first brewed in Toluca, México, in 1865 by Compañía Toluca y México. Grupo Modelo bought out Compañía Toluca y México in 1935. It is generally sold in standard 325 ml (11.0 U.S. fl oz; 11.4 imp fl oz) bottles and 940 ml (31.8 U.S. fl oz; 33.1 imp fl oz) familiares; a smaller 150 ml (5.1 U.S. fl oz; 5.3 imp fl oz) bottle exists, but it is rare. The labels of all its presentations depict Gambrinus holding aloft a frothing mug. Victoria beer is available in six, twelve, and twenty-four pack bottles in 39 states. Pacífico is a 4.5% abv pale lager originally brewed in Mazatlán, Sinaloa. The name means Pacific. The picture on the bottle is the city's lighthouse, for which it is famous, surrounded by a ring buoy. A light variety was launched in 2008. Negra Modelo is a 5.4% abv Dunkel-style lager  first brewed in Mexico by Austrian immigrants, and was introduced as a draft beer in 1926. 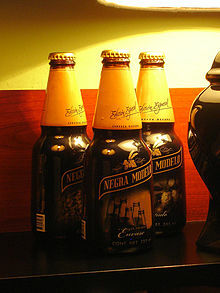 Negra Modelo comes in an unusually shaped, wide brown bottle with a trademark gold label. The full name of the beer is Cerveza Negra Modelo. The word "modelo" means "model" or "example" in Spanish. "Negra" means "black" or "dark" and modifies "cerveza." First bottled in 1925, Modelo Especial is the #2 imported beer in the U.S. by case sales, selling 22.9 million annually. Modelo Light is a light lager that was first produced in 1994. Estrella ("star" in Spanish) is a pilsener beer produced in the Guadalajara Modelo plant and can be found in all of Mexico. Estrella was first produced in the late 19th Century by Cervecería Estrella (currently known as Cervecería Modelo de Guadalajara), that Grupo Modelo acquired in 1954. León is a Munich-type dark amber-colored beer, that mixes a sweetness with light bitterness, and a white foam. The León brand was first launched into the market in the early 1900s, its origin is traced back to the southeast region of Mexico, over the years it has become popular throughout the country. Grupo Modelo is the owner of the Extra convenience store chain. Extra boasts 2,100 outlets in Mexico and is a part of Grupo Modelo's vertically integrated model of both producing and selling beer. ^ a b "Reporte Anual Final 28 06 2006" (PDF). Gmodelo2.com. Archived from the original (PDF) on 2011-07-11. Retrieved 2011-12-06. ^ Brianna Sacks (Aug 6, 2014). "Anheuser-Busch targets Latinos with new Mexican beer import". LA Times. Retrieved 3 October 2017. ^ "Anheuser-Busch". Marketwatch.com. Retrieved 2011-12-06. ^ "InBev to buy out Modelo for $20.1 billion". cleveland.com. 2012-06-29. ^ Hibbard, Matthew (2013-06-04). "Anheuser-Busch InBev completes Grupo Modelo merger". St. Louis Business Journal. Retrieved 2018-12-08. ^ O'Toole, James (2013-04-19). "AB InBev and Modelo merger set to move forward". CNN Money. Retrieved 2018-12-08. ^ "INDIA: Mexican beer giant Grupo Modelo launches Corona: Beverage News & Comment". www.just-drinks.com. Retrieved 2009-03-20. ^ "Tecate, FEMSA's top-selling beer in the U.S. market, reached fourth place in imported beers in the United States in 2000. (Company News)". www.allbusiness.com. Retrieved 2009-03-20. ^ "Riboflavin-sensitized photooxidation of isohumulones and derivatives". Rsc.org. Retrieved 2011-12-06. ^ BeerAdvocate.com, Inc. - Jason and Todd Alström. "Beer Advocate description". Beeradvocate.com. Retrieved 2011-12-06. ^ BeerAdvocate.com, Inc. - Jason and Todd Alström. "Vienna Lager". BeerAdvocate. Retrieved 2011-12-06.